After the high mountain tour, a weekend in the flatlands. This image is for all of you, who think, why do I get not images of the Milkyway like Tom Fear does. That’s because you are not away from the light pollution and the high moisture of the lower atmosphere. 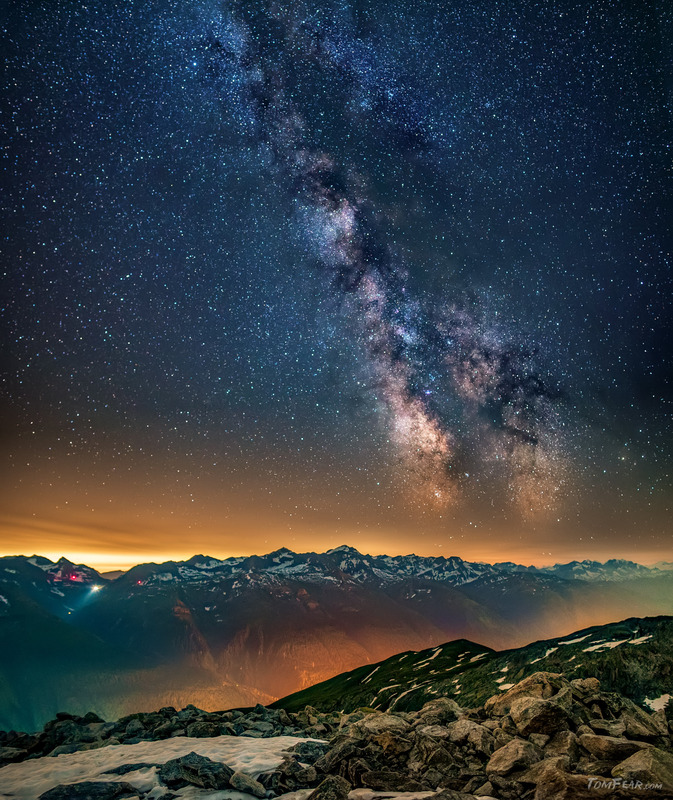 As you can see, here on 1000m on the Weissenstein in the Kanton Solothurn, you can barely see our galaxy. And you can also recognize why, because of all the many lights around you and towards the horizon. If you are looking closer, you can see the beginning of the alps. And the next time, when you are annoyed about your starscape, think of me, I’m fighting with the same problems. If you want to solve this problem, then do it like me, drive to a less polluted area. Two meteors, the andromeda nebula and the milkyway. Well, every good story comes to an end and so will end this trip with this amazing image of the galaxies. The milkyway is obvious and if you’ll look closer, then you can, in the middle of the left image part, see a smeary spot, this is andromeda. After I packed all my gear into my rucksack, I started to walk down to my car. In the middle of the way I was observed by bunch of glowing eyes, which were a herd of sheeps. But it’s always a bit friable, when you see glowing eyes in the middle of nowhere. At the end I reached my car in one piece and I could visit another interesting spot in another amazing night, between the mighty alps. 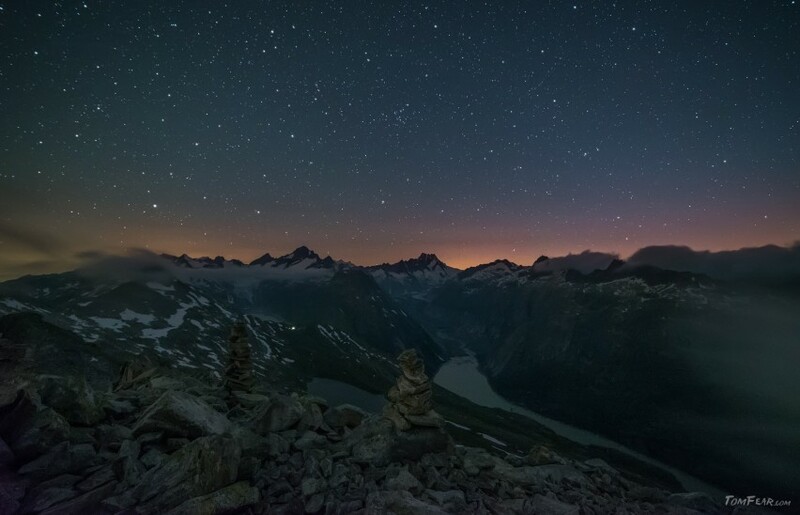 At midnight on the top of a mountain. You ever took a funicular up to a mountain, enjoyed the whole panoramic view from the peak and took a refreshing coffee, before you entered the funicular again on the way down? Well, this will not happen, if you stand at midnight on the peak. Even if there is a funicular, it will not run at this time. And if you want something for your thirst, you need bring up by yourself, all restaurants ar closed now. But at this particular spot, you have to walk anyway, there is neither a funicular nor a McDonalds on the top. 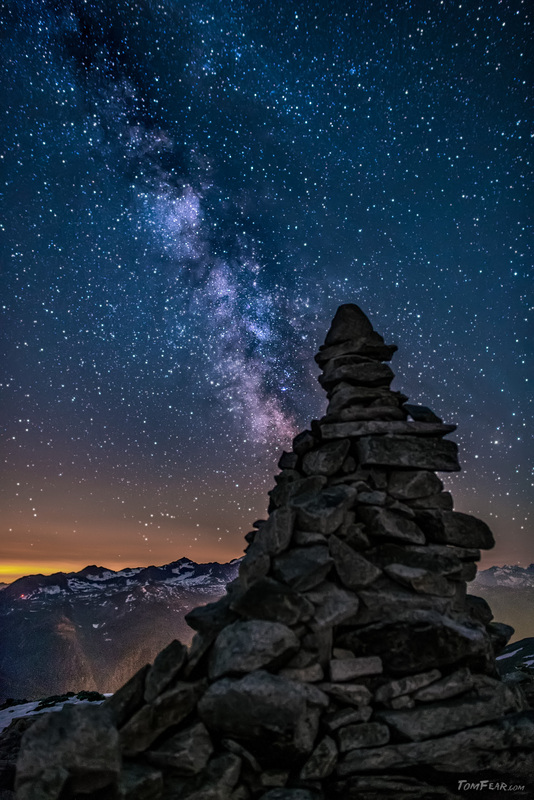 Maybe some ghosts between the cairns, but else you are alone and you can enjoy the silence of the mountains. Except the loud noise of the wind and the rattle of your teeth, because it’s below zero degrees. They always hang around and do nothing, except cover the light. It’s the same on every alpine mountain, motionless and useless are the stone men (german for cairns) sitting on the top and annoying me. And nothing can bring them to a move. I shouted, I asked it and I threatened them. But no, they moved not an inch. Okay maybe it was the wrong view and they have another reason to stay there. It’s maybe an ancient try to increase the total height of a mountain. Ah yes, like all the tall antennas on the skyscrapers in the big cities around the world, to increase their height, a few extra meters. Another shot from the top. After the galactic firework last time, a silent view to the west with the glaciers and the high mounts. This image was taken with 12800 ISO, but I took two shots and stacked it to reduce the noise. And it’s really amazing how less noisy it is. Okay, there is noise, but the only thing I saw was a bit of the horizon, nothing more, it was so dark. 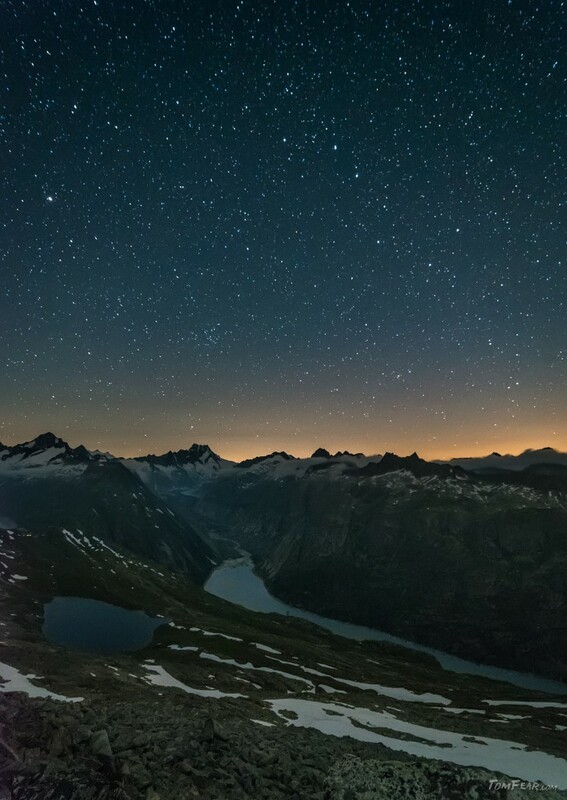 A pure and clear view to our galaxy on 2800m at midnight. As I promised, let me present to you, the Milkyway. An hour earlier, I thought, that I’m again watching the famous movie “The road was in vain”. The clouds were so thick I saw the clouds flying by in the beam of my head lamp. And after I was on the top, my backpack was wet from the clouds, although it was not raining. But now, within minutes all clouds were gone and I realized the cold air. I started around 30°C and I thought, damn I’m a pantywaist, if I’m cold in the middle of the summer, what would it be in the winter. I walked back to my rucksack to grab my second pair of gloves, when I saw that my backpack was no more wet, it was now frozen! Okay, it must be very cold and this is good, because the air is getting very clear to see the Milkyway. What shines through the fog there? Within minutes the weather has changed. Where had I ended? Ah yes, … and I turned me around and it blows me away! While I was taking a few photos to the northern direction, all the clouds are gone and only a thin fog was left. And what can we see there? A brighter band of light, that’s maybe the Milkyway. Because I was walking the wrong way, it was nearly midnight, when I reached the peak. If I were earlier on the top, then I had seen nothing and because of the cold wind, I certanly left the top frustrated a few minutes later. But so I was at the top, nearly to the best time to see the Milkyway. 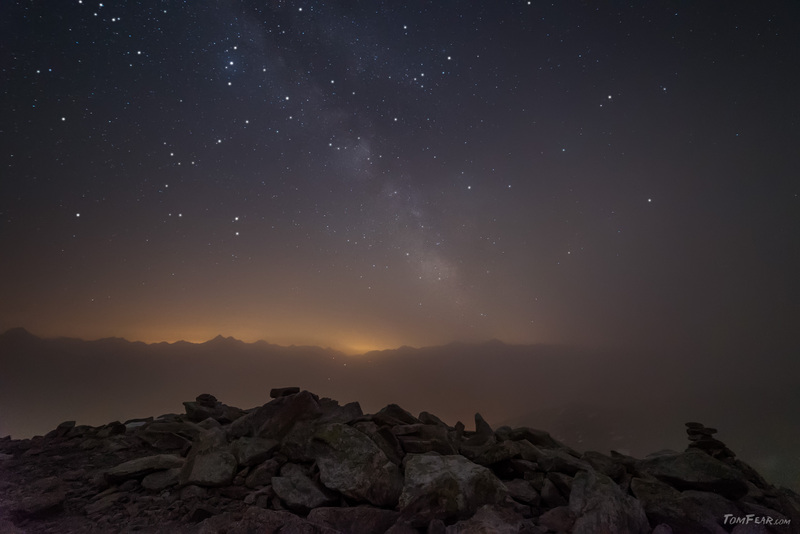 What a moody image and within seconds all the fog was dissolved and I could take one of the most intense shot of the Milkyway which is possible in the centre of Europe, but stay tuned and see it in my next article. It was windy, cold and foggy on my steep way to the peak. After my short excursion on the wrong way, I climbed the correct, steep trail up to the peak. Because it was already late, it quickly became dark. The good thing was, because it was so windy I was not sweating although it was really steep. And the wind was blowing and blowing, but it blows the clouds not away, the clouds becomes thicker and thicker. Soon I saw, in the beam of my headlamp, the clouds flying past. Oh, no the wind didn’t blow the clouds away, he brings the clouds to me. Sigh, another night of effort without any reward, but now as near the peak I was now, I wouldn’t give up and I will bring it to an end. The last part of the trail was not only steep, it was also stony and I had to climb from stone to stone through the dark and foggy night. 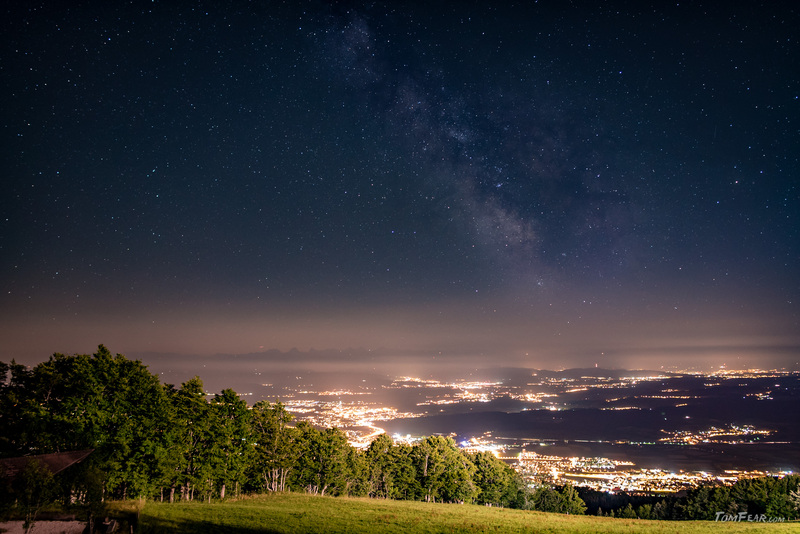 Yes it was pitch dark, because of the new moon, which was the main idea, so I can see a clear and beautiful Milkyway. After I reached the top, the wind was still blowing and I was surrounded by thick clouds. Only to the west I could see some stars. Therefore I put my backpack to the ground, took my tripod and mounted the 14mm lens on the A7s. Apart from some stars, I couldn’t see nothing, it was really, really dark. Okay, take some shots from the direction where I can see the few stars. Because it was so dark, i pumped up my camera up to 12800 ISO and then … BAMM! Still windy and still clouds in the sky. A few minutes later I had a good view over the Grimsel barrier lake. And because it was still windy I was full of hope that the clouds will disappear in the time until I will reach the peak. So I was hiking further along the panoramic road to the left. But wait! Can you see the line over the lake on the right part? It’s the cable of the Sidelhorn funicular which comes up from the Hospiz. You know, the Sidelhorn funicular! Where did I want to go? Yup, up to the Sidlehorn. If I had read my map correctly, I had to know a few minutes earlier, that this way leads me not to the Sidelhorn peak. But Mr. Fear needs another few minutes until he realized, that this way can’t be the right one and with some nice words on his lips, he marched back to the point, where the steep part begun. Read the next time about my way up through the clouds to the Sidelhorn peak.